I popped into the butcher’s the other day on the pretext of buying some ham, but I really wanted to check that the new baby had arrived safely. The young mother was looking calm and rested. Everything had gone well. Her daughter had arrived exactly on the due date, which was perfect, since they had shut the shop for their annual break and two weeks later she was back behind the counter. I said that she was looking well and remarked that it must be a lot of work, especially as she and her husband already have a small son. “Yes”, she replied with a big smile, “we did need to get ourselves organised and sometimes we open a little late, but our customers understand. In any case, we love what we do so we manage just fine”. It’s like that around here, shopping is a social occasion and about much more than just purchasing stuff. We actually eat very little meat but there are two excellent butchers and a further two equally excellent stalls at the market so we try to spread our limited custom fairly between them. 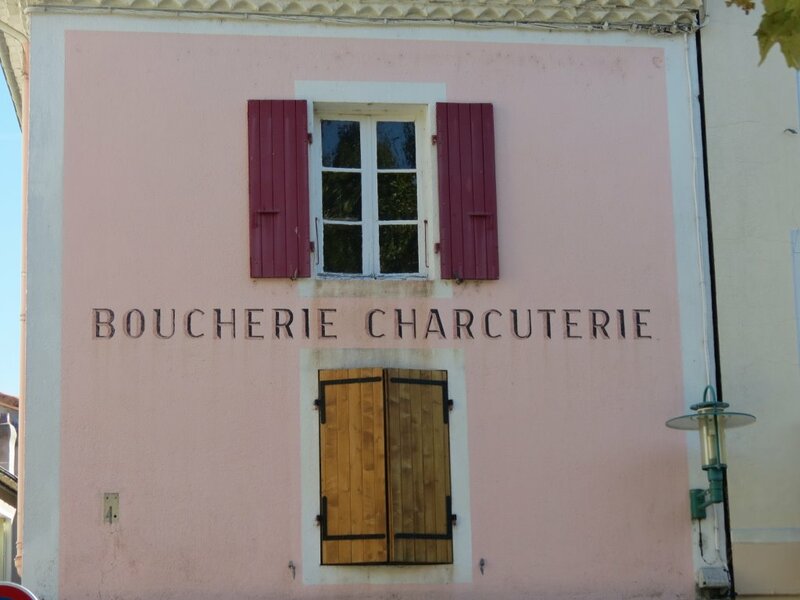 The experience of a good boucherie charcuterie is not to be missed. To my mind the mark of a good butcher’s shop is whether it provides chairs! 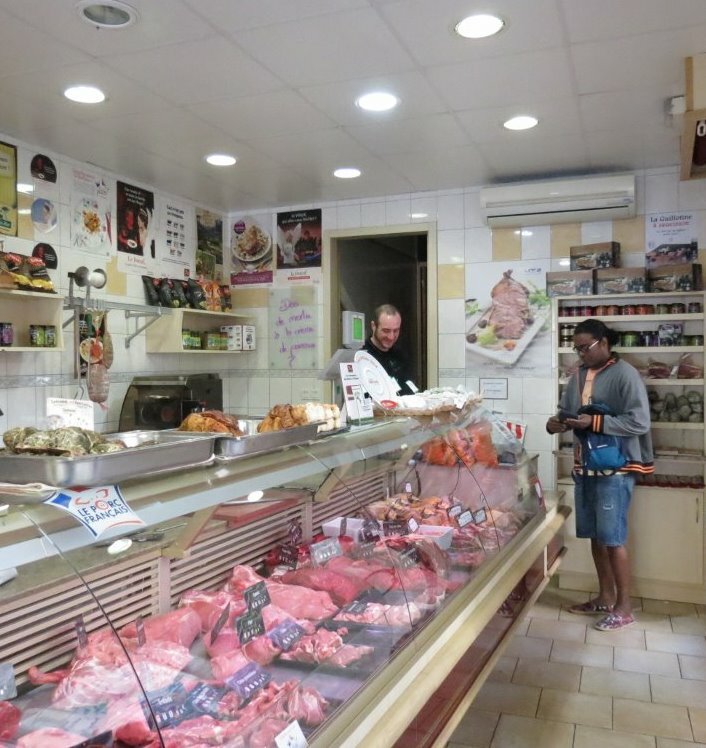 Buying meat is a serious business and customers tend to discuss their requirements and choices with the level of concentration that you might expect to encounter in a dress shop. The queue of waiting customers (you do indeed queue in such places, with as much discipline as at an English bus stop) remains perfectly patient and good humoured and older clients appreciate being able to take the weight off their feet. So it naturally follows that there tends to be an element of showmanship attaching to a good butcher. M Candy, now retired, whose shop we patronised for many years, was a past master at amusing the gallery. Small, dark and dapper he kept up an uninterrupted flow of perfectly timed and slightly risqué comments as he deftly sliced, pared, minced and chopped, which were highly appreciated by his audience both male and female. His wife, taller than him, slim and elegant, was relegated to less spectacular tasks such as slicing ham, totting up the bills and operating the cash register, and kept her eyes demurely lowered with an air of not understanding her husband’s double entendres. We do miss M Candy and his shop. On the wall was a large framed photo of him in his youth, white-coated in the cattle market sizing up a magnificent animal and their little black dog kept guard at the door, the handle of which was a cow horn, which he took with him when he left. 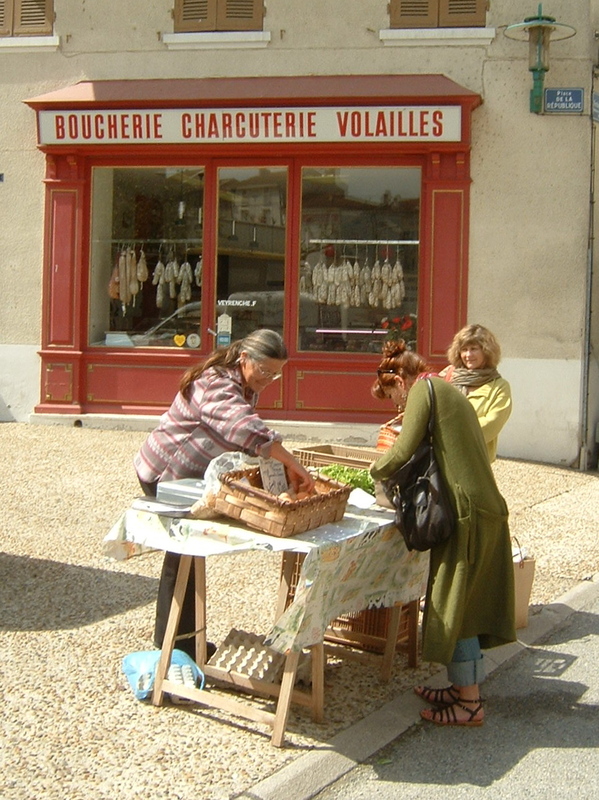 But the good thing is that both the butchers and the bakers in Lamastre are all now run by young couples who have taken over from owners who have retired and in so doing given a new lease of life to the traditional style of food shopping in France. For the locals there is the personal touch. 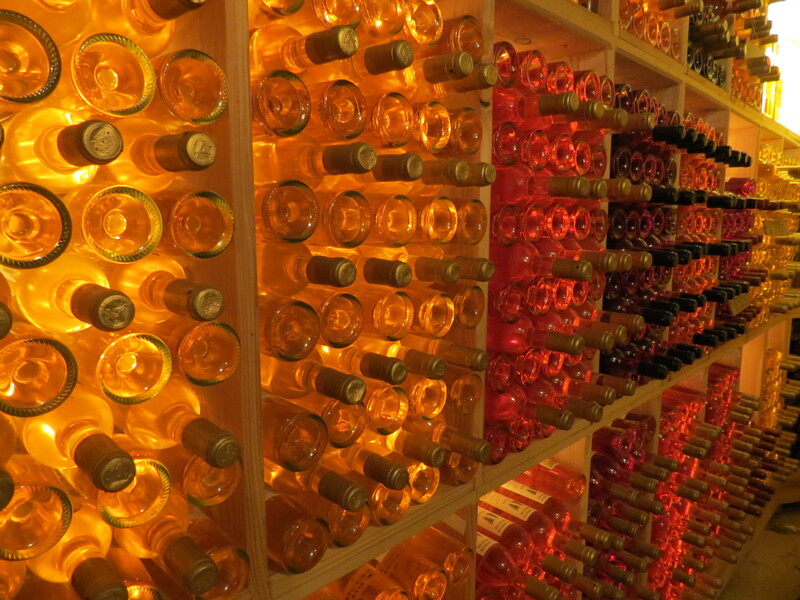 In one shop the young woman always brightly exclaims “très bien”, in response to whatever you ask for, as though your selection is exactly what she would have chosen for you herself. The other day I noticed her returning an empty jar to a couple of customers. 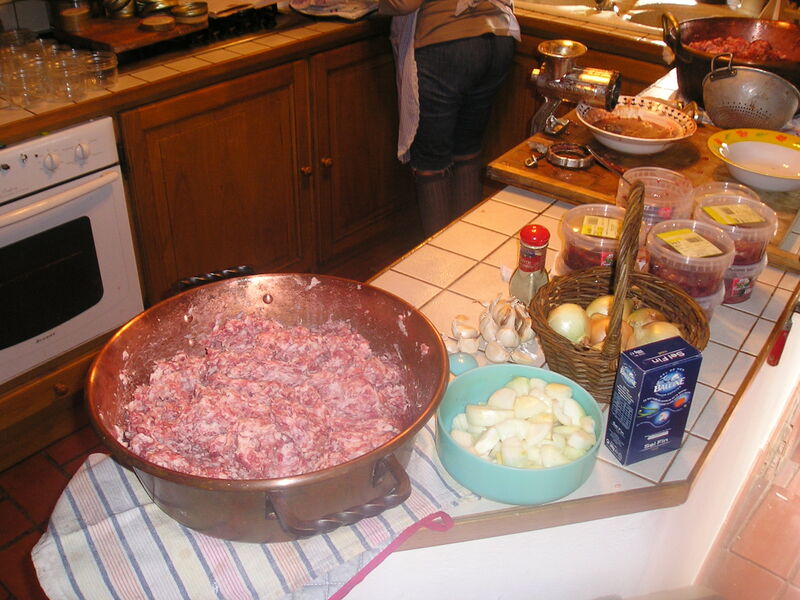 She congratulated them on the pâté they had made, which she said her family had enjoyed and the customers in turn complimented her on the quality of the ingredients she had supplied. Not the sort of conversation you expect to hear in Tesco! Nor, indeed, a slightly surreptitious exchange about fresh water crayfish and the fact that Madame could expect a few to be available next Saturday . . . . . The other butcher’s has an energetic staff who wear team T shirts on market days. They can be a little brusque when things get busy but they certainly listen to their customers. One Tuesday someone wanted a roasted chicken and was told “Oh we don’t do them on market days: il y a trop de poulets rôtis partout!” Nevertheless, the following week the rotisserie was back outside the shop, with plump chickens rotating slowly and smelling delicious. All butchers know which customers have dogs, and will step into the back room whilst they are counting out change and reappear with a bag of bones. I once heard a lady in the market, on receiving her plastic bag ask if she could also have “du mou pour le chat”. As pieces of lung were scooped up for her cat’s delectation I noticed the foreign couple who had been waiting behind me were beating a retreat, looking a trifle green about the gills! I must admit to being somewhat wimpy and ambivalent about buying and eating meat. Traceability here means that all the animals have been raised and slaughtered locally and the name and address of all the supplying farmers is displayed on a blackboard for each type of meat, together with the date of birth and slaughter of each animal. (All that’s missing is a graduation photo!) And whilst it does give a sensitive person pause for thought, at least I know that they have had a short but happy life, mostly out in the meadows and able to enjoy the natural surroundings as they should. So no distressing pictures, and in fact these cows, in the field below the Doghouse, are milkers and in no danger of ending up as stew! Ardèche Oranges . . . ? We drove up to Paiharès, a lovely little mountain village, over the week end to stock up on fruit juice. 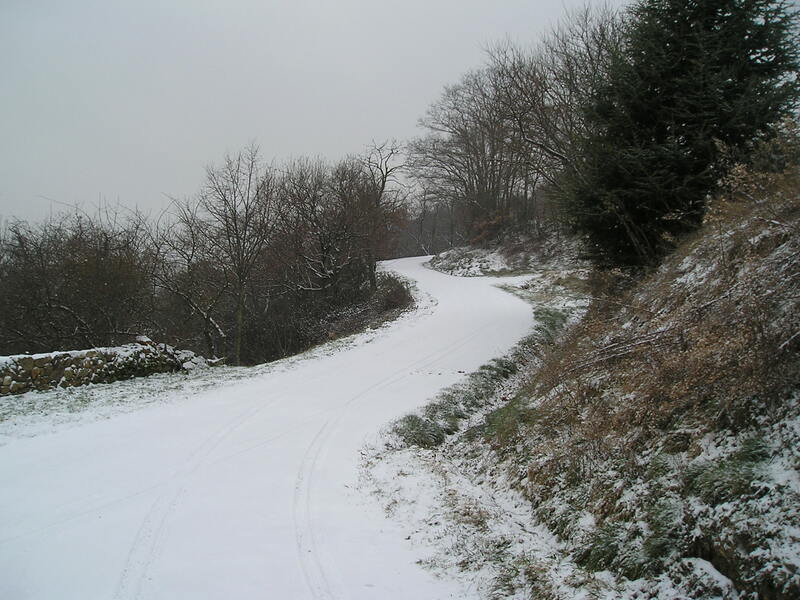 We climbed the twisty road amid snow flurries, and the village came into view, clustered around its little church. 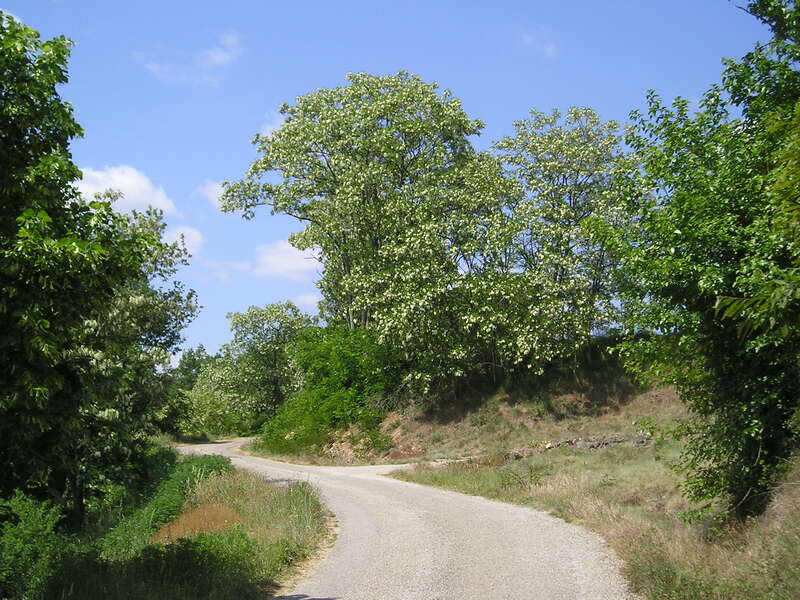 Paiharès is located 200m higher than les Sarziers, and is well known for its apple trees, which are happier up here than in the drier conditions of the Doux valley. 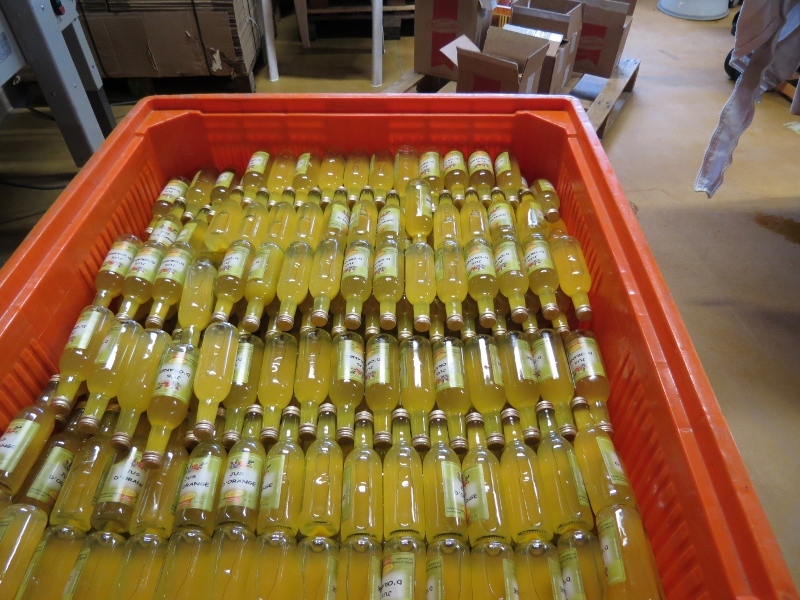 About ten years ago a small pressing and bottling plant set up to produce apple juice, soon diversifying in to quince, apricot, peach and all the other local fruits. 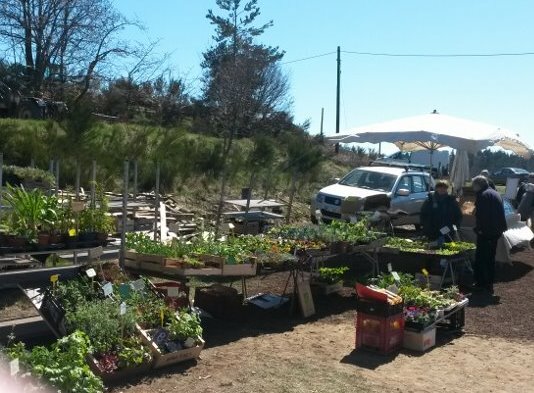 Called Nectardéchois, it is yet another small co operative enterprise which prides itself on providing a local service and making use of local produce. Anyone with 100kg of fruit can bring it to be pressed and leave with their own bottles of juice complete with personalised labels. 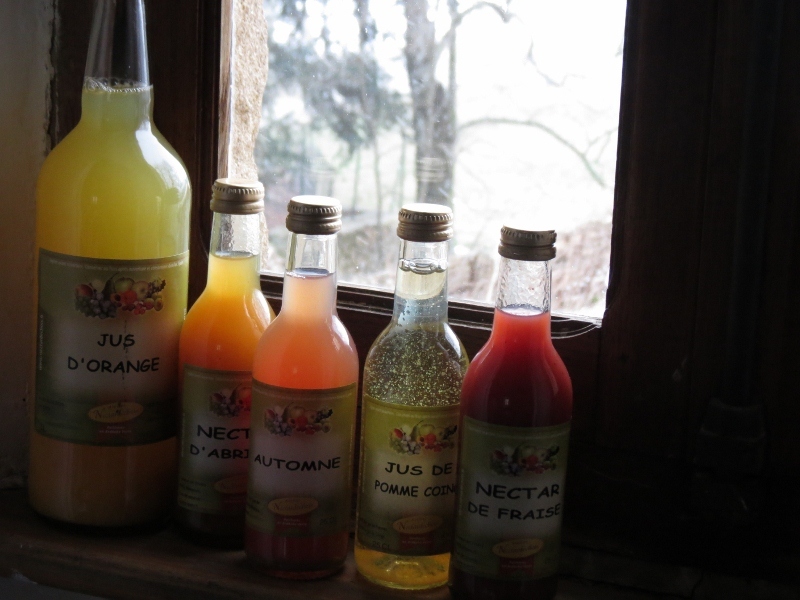 They make some delicious flavours, such as nectarine, cherry or strawberry and mixtures like apple, pêche de vigne and quince, but the reason we were there was to celebrate their first cuvée of orange juice. Oranges from the Ardèche? What’s this all about? Still faithful to their ideal of using local produce, they have come up with a very smart idea. 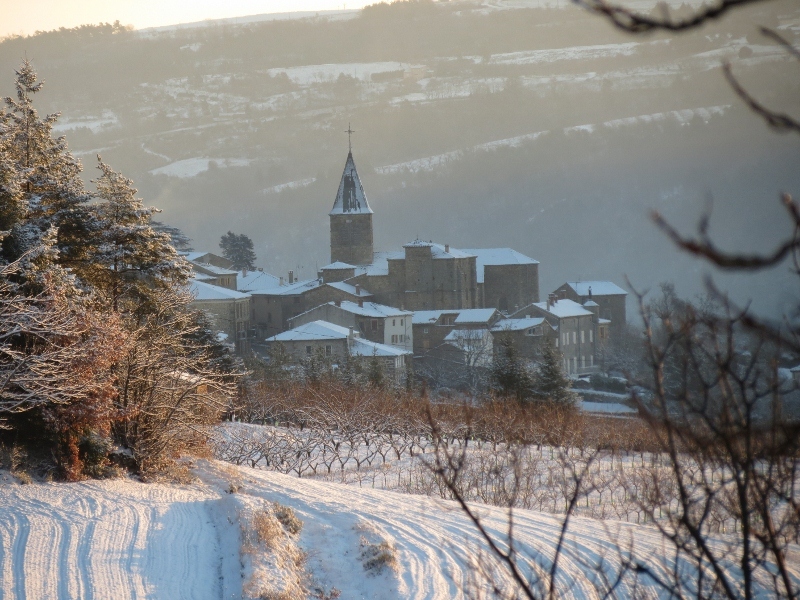 In Aubenas in the south of the Ardèche Sabaton, a venerable but less widely known company than Clément Faugier, have been making wonderful things out of chestnuts, truffles and ceps since 1907. In the 1920’s Paul-Roch Sabaton, the original founder of the company joined forces with Jules Reynaud and began to diversify into fruit products – principally jams and fruit in syrup. They cornered a particular niche market in England with the export of blueberries in syrup. Blueberries are known to improve the eyesight of people working in poor or artificial light and they were imported principally into mining areas, to help preserve the sight of the miners. This may sound far fetched, but I was once prescribed blueberry extract and found that it did indeed have a beneficial effect. During the war years sugar was severely rationed, and there were no more marrons glacés for the duration, but the company came up with various ingenious ideas for making erzatz jam using concentrated grape juice as a sweetener. 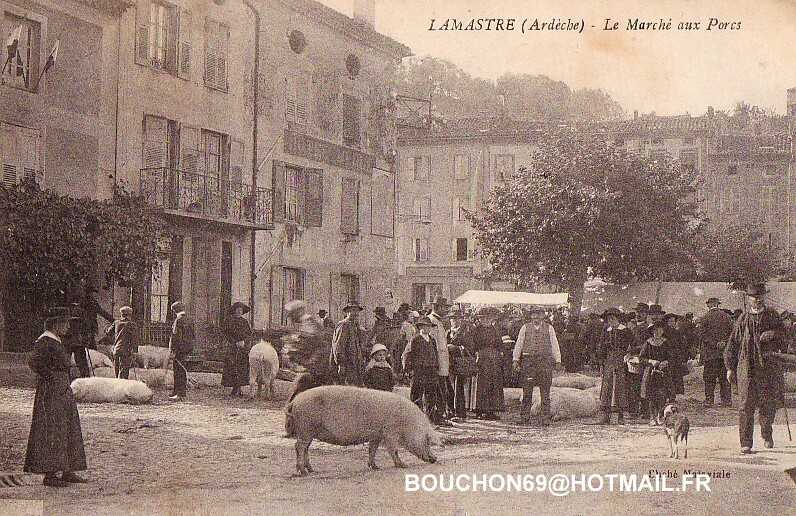 Cans and jars were at a premium too and in order to obtain them little trips to the suppliers with a basket of Ardèche saucisson, cheese and butter were occasionally necessary . . .
On the death of his father, Paul Sabaton bought out his partners and the firm reverted to its original name. In 1961 he added a new line: crystallised orange peel. After a few false starts and adjustments to the recipe, Sabaton oranges really took off with pâtissiers and in the 1980s, with the other fruit products suffering from competition with imported and frozen fruits, they started to produce strips of candied orange peel which, covered in chocolate make the delicious orangettes for which Sabaton is now famous. 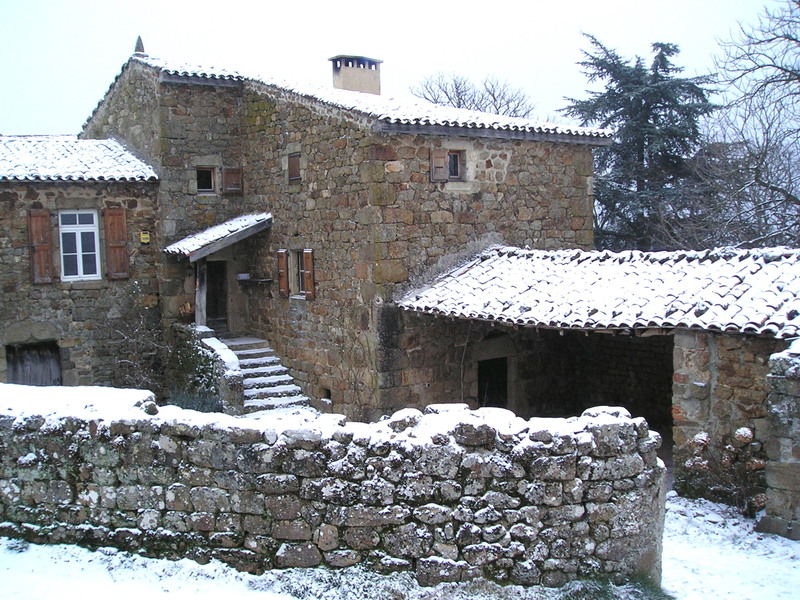 Back in Paiharès, Nectardéchois had the bright idea of purchasing the peeled oranges from Sabaton and pressing them for the juice, which enables them to work in the winter when there is no other fruit around. As they point out, although the oranges are grown in Valencia in Spain, they are purchased from an Ardéchois firm. The result, by the way, is delicious. A regrettable unforseen circumstance however is that there are a number of very frustrated inhabitants of Aubenas who have lost their traditional supply of unused oranges. It’s the 6th January, Epiphany or Twelfth Night and time to enjoy the ritual of the Kings’ Cake. This is not really a cake but a delicious flaky pastry confection with a marzipan filling and hiding a secret. From now until the end of the month boulangeries will be full of them – a last fling of end-of-year excess before the dismal days of January. 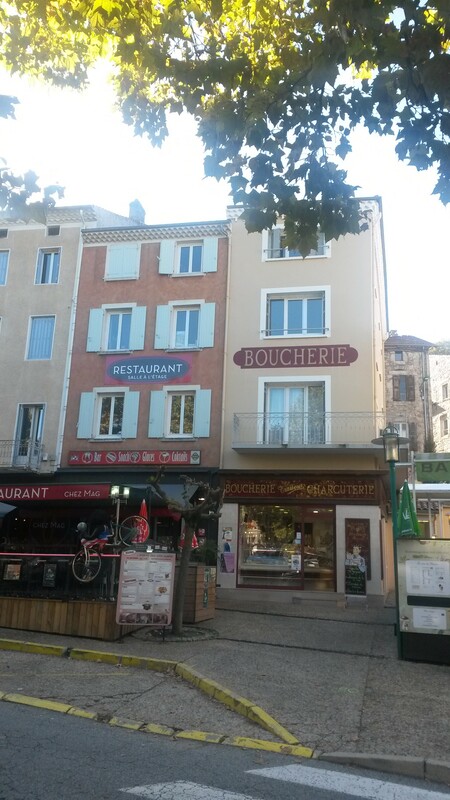 As our Walksweeks guests know well, we can rely on Marie and her husband, who run the boulangerie patisserie in Arlebosc, to come up with a particularly yummy galette. Once you get your galette home there is a specific ritual to be followed. The youngest member of the party has to hide under the table whilst it is cut into the same number of portions as there are people present. (In the past an extra portion was cut, to be given to the first needy person to knock at the door). The cutter asks “c’est pour qui?” and the voice under the table indicates the recipient of each slice. It is advisable to eat your portion carefully, so as not to break a tooth on the little porcelain figurine which lurks in the marzipan. The lucky recipient of the fève – which was once literally a dried bean – is designated king or queen for the day, wears the crown which is sold with the galette and is allowed to boss everyone around all day – guess who won ours!! The tradition is a very old one, apparently deriving from the Romans and with obvious links to the reversal of roles of the twelve days of Christmas and the Lord of Misrule. Since 1975 a Galette de l’Elysée has been presented to the President of France at his official residence, the Elysée Palace. However this one does not contain a fève, and sends a clear message that, although he may be occupying a palace, he is definitely not a king and should not be getting any ideas! 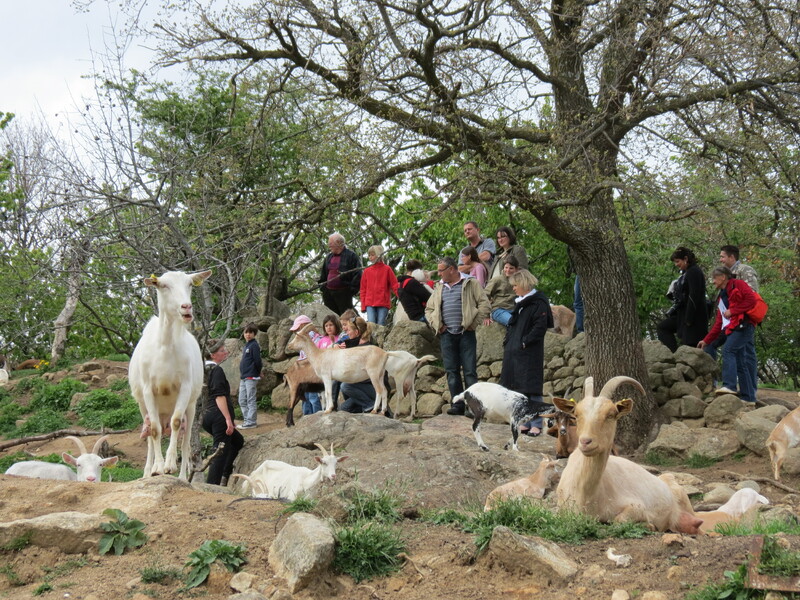 This week end nearly 80 Ardèche farms held their annual open days, including ten in our immediate surroundings. This event, now in its 13th year, is designed particularly to attract people from the nearest large towns in the Rhone Valley and to offer them a day out to discover how the best local food is produced whilst simultaneously enjoying the wonderful landscapes of our area. It is always a big hit for families with small children. Our first port of call was this very traditional goat farm, which produces three different types of cheese, all equally delicious, yoghurt, eggs and charcuterie. 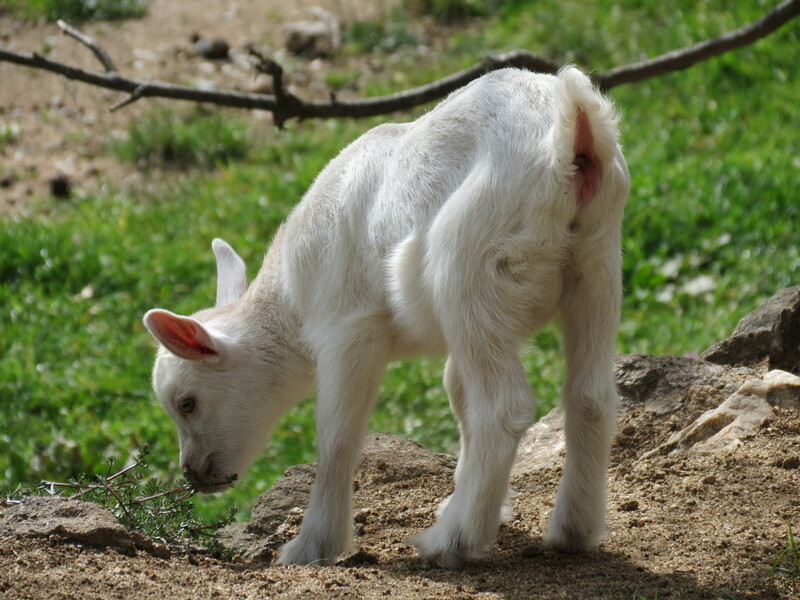 The children loved the baby goats and were enchanted to watch the birth of a kid. One of the parents (from the valley) asked whether the goats were given names. Only the females, came the reply. Why’s that, the perplexed papa enquired. Well, I suppose we could call the male kids Méchoui or Gigot (barbecue or roast), said Geraldine with a grin! She obviously loves her goats and was being partiularly attentive to the first-time mother, but there is no room for sentiment in this business. 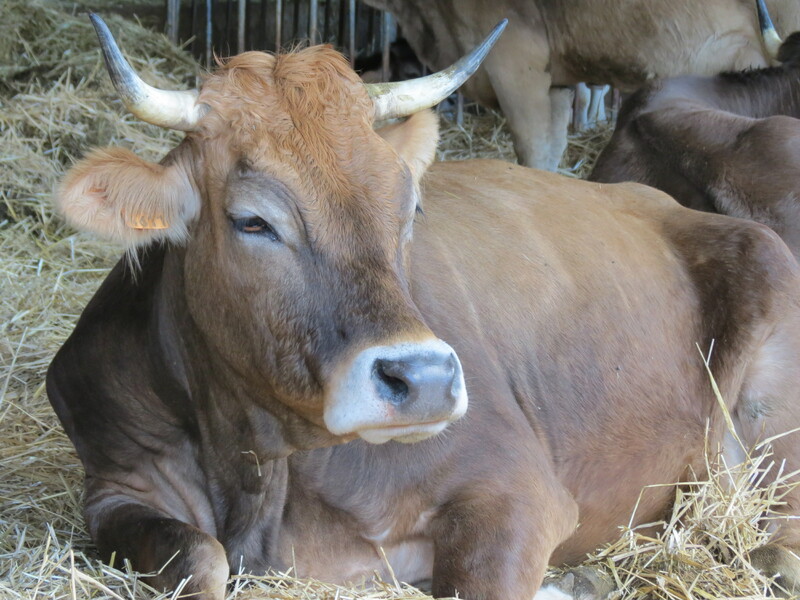 Amongst the other local farms were several that we know well and who supply us with delicious chestnut products, fruit juices and fresh trout, but we were curious to visit two relatively recent arrivals and so set off to Chaupous to see Carole and Nicolas at work on their sheep farm. Unfortunately we had forgotten the camera, so no pictures of this beautiful wooden farm and its dairy and cheese making facility. 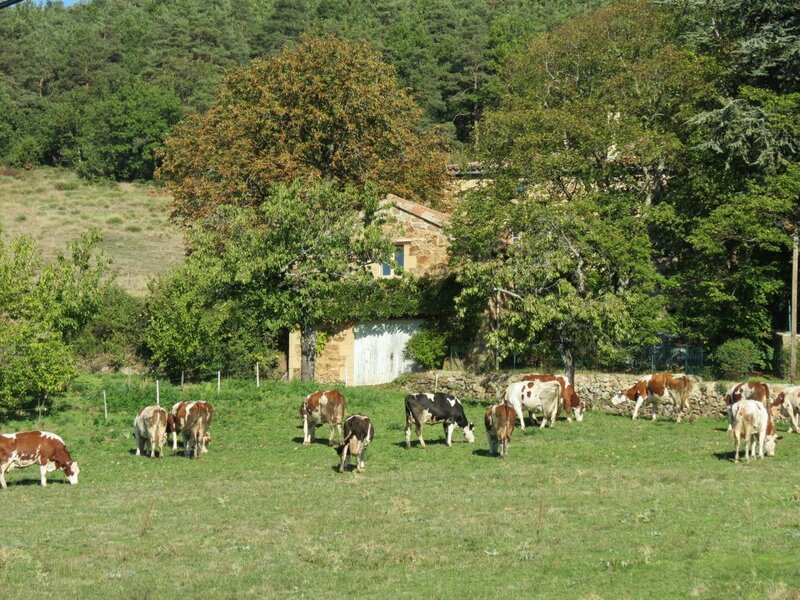 They have sixty ewes and make wonderful cheese, yoghurt and “délice de lait” a sort of sweetened condensed milk, flavoured with ginger, cardamom or other spices. Definitely delicious! Nicolas put a couple of his sheepdogs through their paces for us and Carole explained that in the winter, when the ewes are resting, they harvest the chestnuts from the trees on their land – 100kg each per day! They arrived here two years ago, and built their farm themselves from scratch. They have two small daughters and run the whole outfit themselves without any employees. They obviously love what they do and their energy is amazing. We left with a basketful of produce! The next day we set off to les Cotes de Fontbonne. 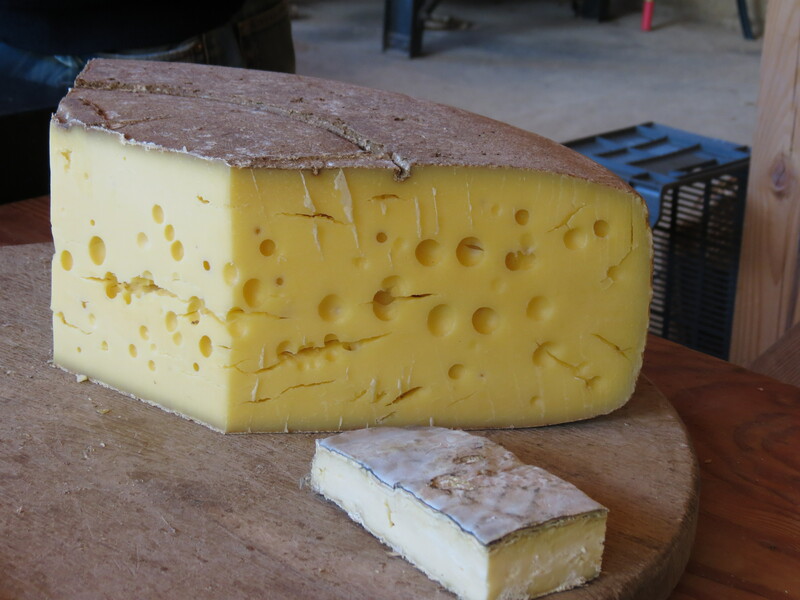 One of our walks passes this dairy farm and we buy their cheese at the market, but we had never visited them before. Once again, this couple built their farm from scratch, using timber frames and adobe made from their own soil. It is so beautifully designed to fit into the hillside and so perfectly constructed that there is no doubt that if Pierre-Yves ever got tired of making cheese, he could become an architect! There was so much to enjoy here. Markus of course was delighted with the Swiss Brown cows and there were lots of dogs to keep Kate happy. There was an area in the hay barn where the kids could run riot and play hide and seek among the bales. There must have been around fifty people there with us and everyone was having a great afternoon. 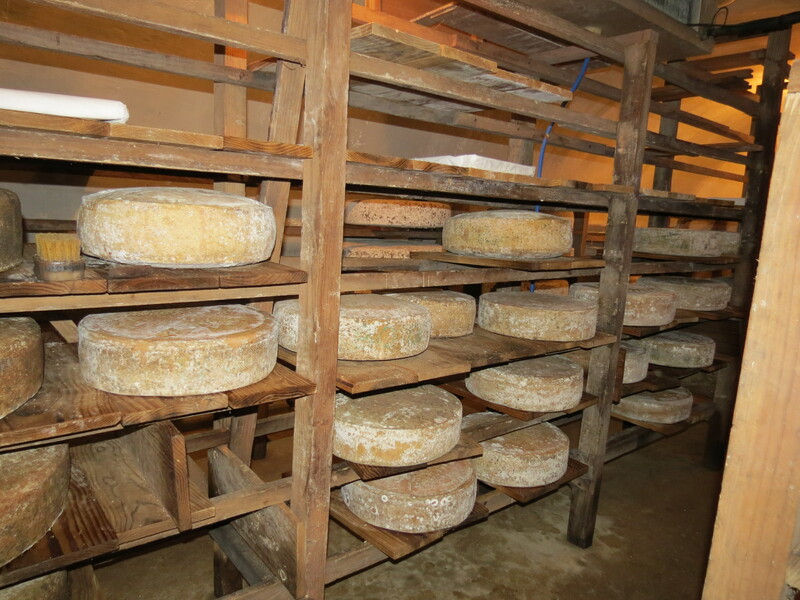 We had a tour of the byre and dairy and Pierre-Yves explained how he makes his three different types of cheese. Next to his maturing cellar his wife Estelle has her own cellar where she makes aperitif wines flavoured with bitter orange, walnuts and so on. We tried her apple juice, made from the fruit from the old trees on their land and perfumed with geranium, which was absolutely delicious. Oh and by the way, all this produce, as at the sheep farm, is certified organic. We are truly fortunate to have so many dynamic producers of outstanding food right on our doorstep and we really enjoy introducing our walkers to all the local specialities. We haven’t yet made it to the snail farm but that is the next on our list! It is at this, the coldest point of the year, that the family pig traditionally goes to meet his maker. 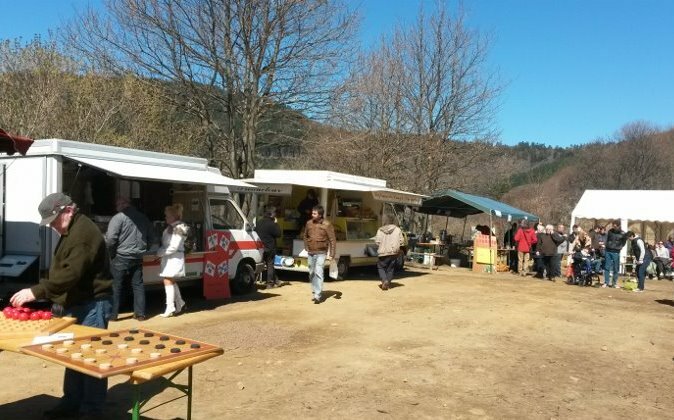 La tuade is one of those big rural events, gathering together friends and neighbours in a massive common operation, which has become rare, although not entirely extinct. Not something that we have ever witnessed, nor, in all honesty, ever wished to. The business of killing the pig, letting the blood, singeing the carcass over an open fire in the yard, dismembering the beast, washing yards of unmentionable bits in freezing water, and then spending days turning the results into kilos and kilos of assorted delicacies requires very stong nerves! But this is still a traditional post Christmas activity and, rather like the way that Seville oranges appear in the shops for marmalade-making in England, the butchers here offer promotional prices on half a pig or a quarter. The local agricultural supplies merchant lays in stores of jars and sterilizing equipment, and big sacks of salt, pepper and assorted spices appear at knock down rates. 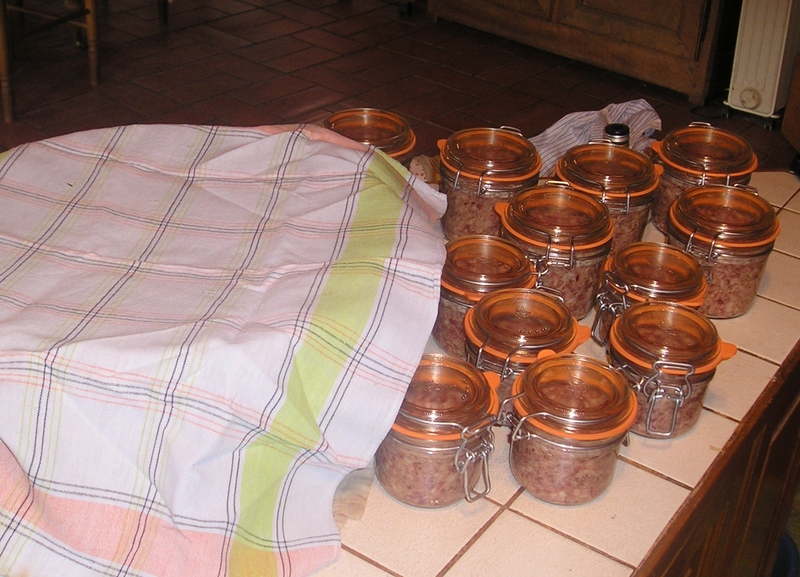 Kate joined forces with a friend the other week end and produced 21 jars of pâté de campagne and a few more of spiced pork: great for apéritifs and picnics for our walkers later on in the year! 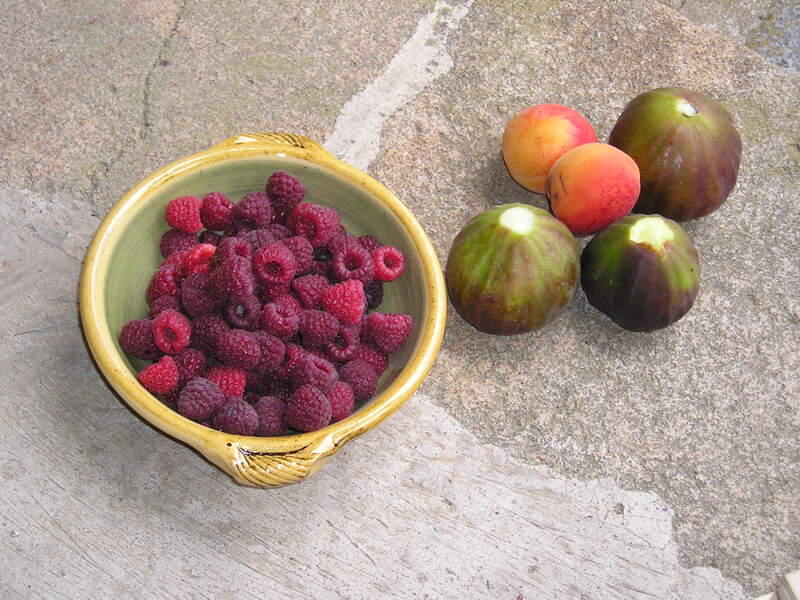 Pour les fruits . . . . . 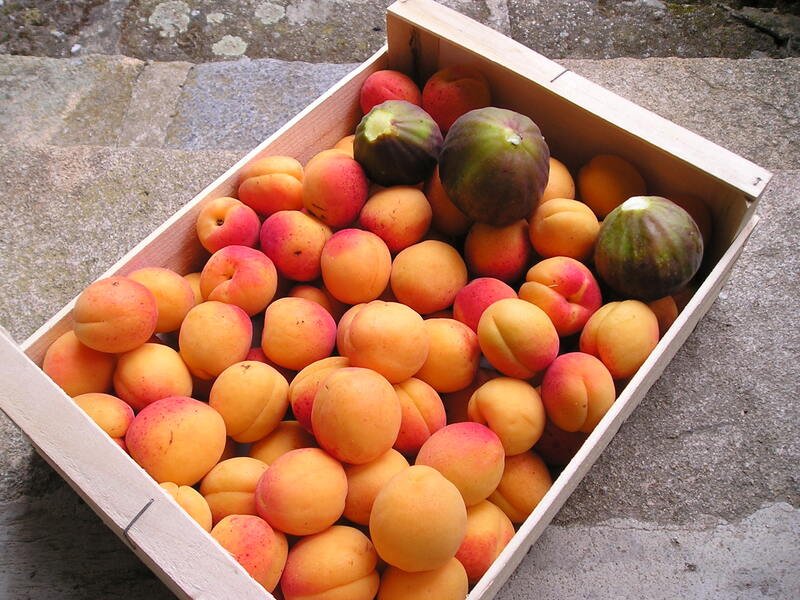 I have just popped up to our neighbour Yves, who lives at Jean Gros, to get some apricots for jam. We love his sign, which obviously caused some scratching of heads when first created, but he must be satisfied with it now as it comes out every year! 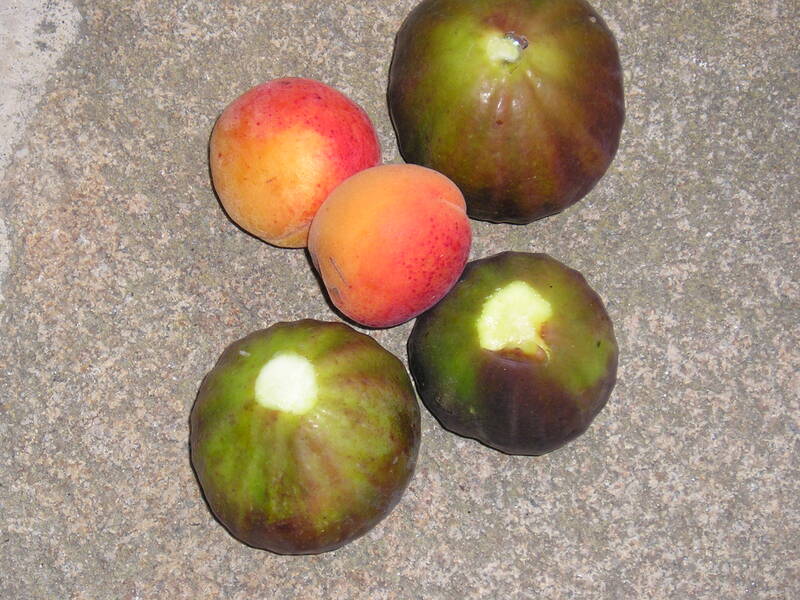 He noticed me admiring the enormous figs on his tree – I have never seen such huge ones, they are the size of a peach – and he cut me off a few with his opinel while we talked about his mulberry tree. Most of the mulberries around here were grown for their leaves, which were fed to the silk worms, and have tiny white fruits which are pretty insipid . At Jean Gros there are two vast old black mulberry trees which produce enormous, juicy and delicious fruit. 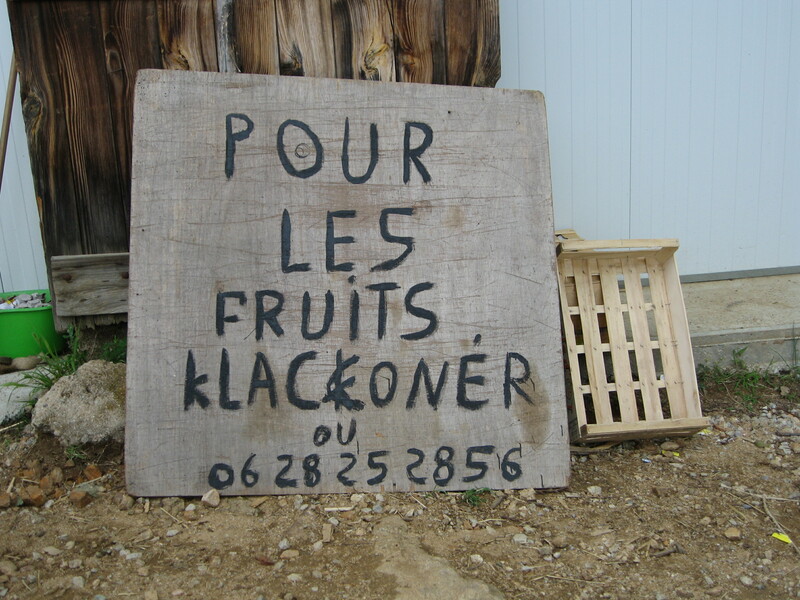 They drop onto the lane, staining it black and I have always been curious to know why they did not pick them – Yves is a fruit farmer after all! He told me that he does not like mulberries, although his grandmother used to eat them. 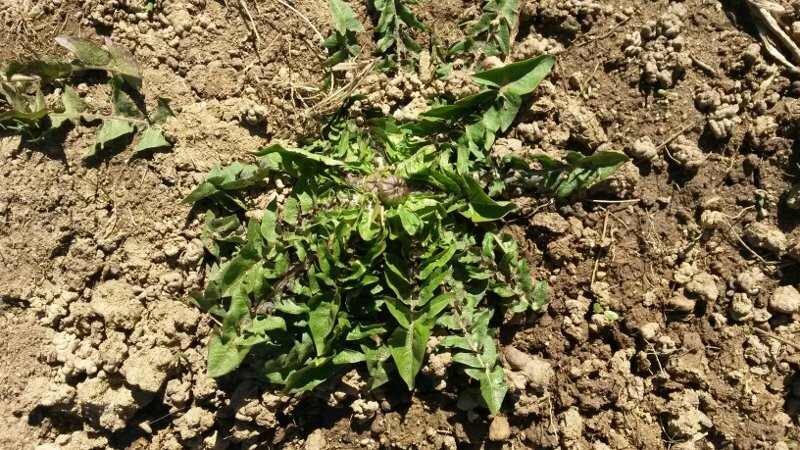 This winter a huge bough blew off one of them and he had to cut it back severely, but it is springing up again and we agreed that such venerable old trees are still very vigorous. He says that he has noticed walkers picking a few fruit as they pass his farm and he does not mind. I am glad to hear this since I have always felt a bit furtive as I snaffled some on my way down from Bozas! I told him that we have considered trying to graft from his tree. He looked at me a bit quizzically but said I was welcome to try. The trees were planted by his grandparents and have not been grafted so if we were to be successful we would have exactly the same tree and the same fruit. After how many years though I wonder! 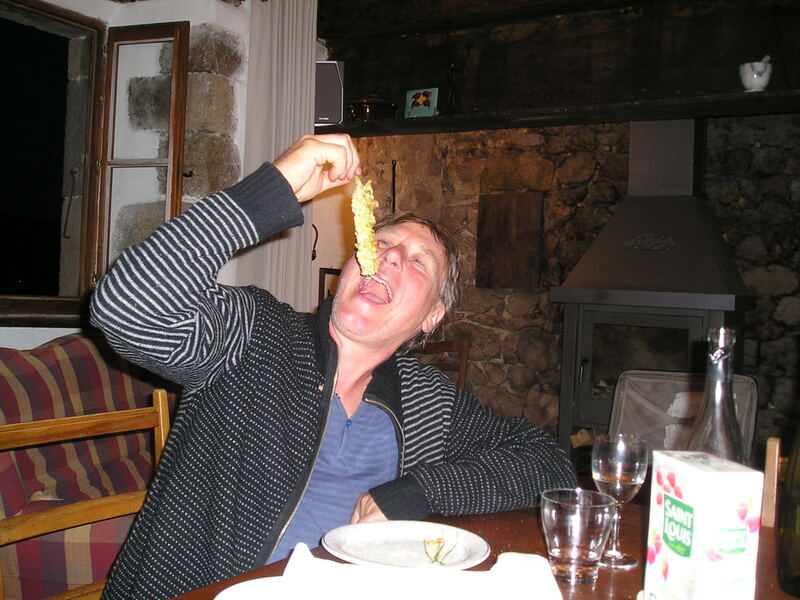 He also let me have a bowl of raspberries – and all for under 10 euros. Let the jamming begin! This is a moment not to be missed! 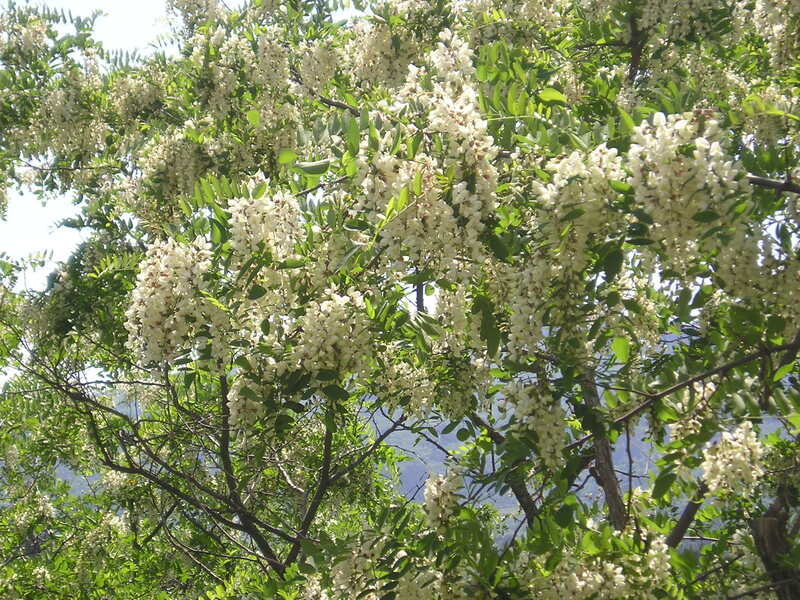 The accacia flowers were spectacular this year and heavily perfumed. It is a great feeling to be able to go out into the lane and pick your dessert!